The Risk Premium Factor presents and proves a radical new theory that explains the stock market, offering a quantitative explanation for all the booms, busts, bubbles, and multiple expansions and contractions of the market we have experienced over the past half-century. 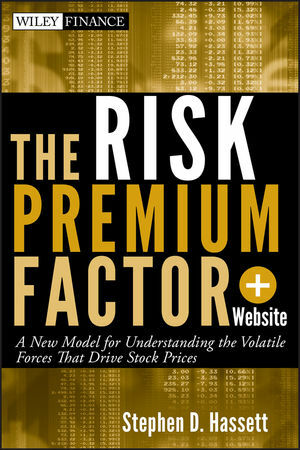 Written by Stephen D. Hassett, a corporate development executive, author and specialist in value management, mergers and acquisitions, new venture strategy, development, and execution for high technology, SaaS, web, and mobile businesses, the book convincingly demonstrates that the equity risk premium is proportional to long-term Treasury yields, establishing a connection to loss aversion theory. Explains stock prices from 1960 through the present including the 2008/09 "market meltdown"
Understanding the stock market is simple. By grasping the simplicity, business leaders, corporate decision makers, private equity, venture capital, professional, and individual investors will fully understand the system under which they operate, and find themselves empowered to make better decisions managing their businesses and investment portfolios. STEPHEN D. HASSETT is a corporate development executive with Sage North America, a subsidiary of The Sage Group plc, a leading global supplier of business management software and services. He has published in the Journal of Applied Corporate Finance and is a regular contributing author for the Seeking Alpha investment website. Previously, he was an executive at the Weather Channel, software entrepreneur and consultant with Stern Stewart & Co. He holds an MBA from the Darden School of Business at the University of Virginia.